The Yoast SEO Plugin is one of the most popular (and advanced) SEO plugins available for WordPress. Many people don’t mess with any of the settings. Either they don’t know how, they don’t know what to change, or they are happy with the defaults. Though you can have a perfectly optimized blog with the default Yoast settings, why not go the extra mile and optimize your Yoast SEO plugin for maximum SEO effectiveness? There are many WordPress SEO plugins out there, but most people either use Yoast or all in one SEO pack. Though there is some debate whether Yoast or all in one SEO is better, the majority of people I see are using Yoast SEO. Yoast is a great plugin to get your SEO in order, and it has some great SEO settings right out of the box. However, for those who want to get the most out of Yoast, there are some advanced SEO settings that you can implement, beyond the defaults. This post goes over everything you need to know to set up Yoast SEO for optimal SEO. 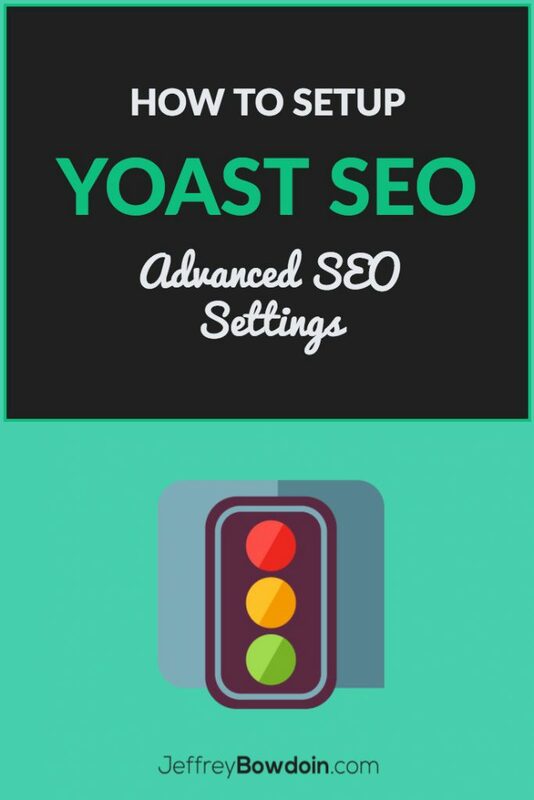 I exported my recommended Yoast SEO settings so you can easily import them into your blog. After importing, there are only a few things you need to add to the settings. You will first want to install Yoast and activate the plugin. Then you will want to enable the advanced settings so you can import my Yoast advanced settings. Then head over to SEO > Tools > Import. First, you need to install Yoast. If you are not familiar with installing WordPress plugins, simply go to plugins > add new > and search for Yoast SEO. Then Install & Activate it. Once installed, you will see, “SEO” on your left hand side of the wordpress dashboard. This is where you will access all the settings of Yoast SEO. Why change it: When you first install Yoast SEO, you will have limited SEO options and functionality. When you enable advanced features, you then will get access to all the other settings such as the XML Sitemap, Social settings, etc. No errors: If you don’t see any errors, you are good to go to the next step. Default WordPress tagline: You need to change you default tagline. Configure the Plugin: This is what this article will walk you through, so ignore this. Postname in URL: You will want to change your permalinks in WordPress for SEO friendliness. Crawl errors: We will later add your site to Google search console, and connect it within Yoast SEO. So ignore this for now. Optional: You can optionally open the configuration wizard. If you follow this post, there is no reason to do the configuration wizard. I will take you through all the standard configuration steps, and beyond what is laid out in the standard configuration wizard. 1. Website name: This is the name that will be shown in the Google search results. It will automatically use the site name. However you can add one here. Typically you will just enter your company brand name, blog name, or your personal name (if you have yourname.com like I do). 2. Choose Company or Person: If you are a one author blog, you can choose person, and enter your name. If you have multiple authors or are a company, you will want to choose company. Google search console is the new name for what used to be known as Google webmaster tools. They just rebranded it to a new name. Many people add their sites to Google Analytics but fail to set up their blog in Google Search Console. This is a huge mistake! There are a lot of benefits to setting up Google Search Console. I highly recommend that you set up your search console and integrate it with Yoast SEO. Also, out of all the people who do set up Google search console, many of them don’t set up Bing Webmaster Tools. This is also a mistake, as Bing Webmaster Tools has some great features for SEO that Search console doesn’t have. There is an advanced section on the Yoast SEO meta box, which will allow you to change the canonical or noindex posts. By default, only administrators can access these settings, and authors cannot. If you enable this section, then it will allow all users to change these advanced settings on the post/page level. If you don’t trust other authors, you should keep this disabled so they don’t accidentally change any advanced settings. You need to choose a separator that you want to show on Google SERPS. It is a matter of personal preference, which one you decide. However, you can never go wrong with choosing two of the most popular options. In the post types tab area you can choose to index or noindex certain types of posts. You want to make sure that both your posts and pages have the setting of index. These are going to be your main places for content, so you want Google to index them. Date in Snippet Preview: This is completely up to you (see below explanation). The only option you should consider changing is the date and snippet preview. There are advantages and disadvantages to this. By default, it hides the date and snippet preview. However, you can change the setting to show the date in the snippets. If you have a large site that’s well established and a lot of your articles are older, you might want to hide the date. If you have an article from 2002 for example, and people see the year 2002, it might look like outdated content – even if you update it for 2016. It still gives the perception of old outdated content. In niches dealing with technology, seo, etc, the freshness of content may be more important to your audience. For example, when I’m researching topics about SEO, I would much rather read an article from 2016, rather than one from 2012. I just assume the article from 2012 gives outdated SEO advice. I often skip the old articles and click on one that shows a newer date, depending on the topic I am researching. On the flip-side, maybe you want to show the date because your articles are time sensitive or they were published recently. The choice is up to you. Usually if I have a new blog I will show the date, and if I have an older site, I will hide it. You have the same option of hiding or showing the date in pages as well. Note: Pages don’t typically show date, and Posts typically do. Even when you hide date in Yoast, it may still show, as that is Google pulling data from your site or even your server. The Yoast plugin can’t dictate whether Google shows or hides the date. However, there are ways you can hide the date or have it update when you update your posts. Should you noindex or index your Media in wordpress? It is commonly recommended to noindex your media files, and I also have the same recommendation. With WordPress, every time you upload a picture, for instance, it will create a webpage for each picture. You don’t necessarily want Google to index each of those pages for the images unless you have a specific purpose for that. For example maybe you have a photography website and you wanted those pages to be indexed. For most of the purposes though you do not want to have those pages indexed by Google. And don’t worry, when you noindex the media, your images will still be shown in Google images! Should you noindex or index your Category Pages in wordpress? Some SEO plugins like on one SEO pack have categories no index by default. I don’t think that’s a good default for an SEO plugin. I think the choice should be made manually. There is a lot of debate between SEOs that say whether you should noindex the category taxonomy. This code just makes it so it doesn’t show any summary on my blog lists in each category page. Usually it will show the first few sentences (from my theme), so I just added that code so it doesn’t show an excerpt (summary). Luckily the default for categories in Yoast is set to index. I think this is a good default setting. I typically recommend this for most people’s blogs – especially for E-commerce sites. Its also worth noting that you should have a description for your category pages that Google can index and interpret if you choose to index your category pages. However, there might be some cases where you want to noindex the categories. By default, tags are set to index in the Yoast SEO Plugin. I recommend that you change it to noindex if it is a newer site. When dealing with WordPress SEO, most people are in agreement that tags should be noindex. If your site is well-established and you have had your tags set to index in WordPress, you might just want to leave it on index. You may get some disagreement here and there, but most people will recommend that you noindex tags in WordPress. For blogs that have multiple authors, and author archive might be useful. For example, if I’m visiting a blog that has say 5 to 10 authors, and I really like one of them, I can click on their name within the blog post. This will then take me to all their posts that they’ve written for that website. But what about websites that only have one author? Is it necessary to have author archives? The answer is no. If your site is a one author blog, there is no point in having these author archives. Basically with the one author blog your offer archives might be the same as your homepage, and can thus be a risk for duplicate content. One way to get past this is you can either Disable the author archives entirely, which will make it redirect to the homepage when somebody clicks on your author name. You can also choose to know index the author archives, to prevent the duplicate content issues. I usually just disable it on my one author blogs, but you can do either one. I would consider this section optional. Some people like to have the date archives because it can offer some user experience benefits. However, I think that the date archives are little bit antiquated and are unnecessary. Especially because they can cause a duplicate content issue just like the author archives. I usually just disabled the date archives on my blogs, but you can also noindex the date archives instead if you prefer. I would recommend that you noindex the subpages of archives in your Yoast. The Meta keyword tag is disabled by default. Most people are in agreement that using Meta keywords is not important anymore. However there is some debate on whether you should use Meta Keywords, so the choice is up to you. If you have any social media accounts, you will want to copy and paste the URLs in the respective fields. Typically I don’t change anything in the Facebook settings. If you wanted to, though, you can choose to change any Facebook setting that you see fit. You can also specify a Facebook admin to take advantage of Facebook Insights. When you have this setting as a large image, rather than just summary, it will show the full larger image of your post when shared on Twitter. The default in Yoast SEO is to use the smaller images. I think that the larger images tend to garner more attention on Twitter. I usually always set this setting in Yoast to use larger images. When you set up a Pinterest profile for business, you can add your website. Pinterest will then ask you to verify ownership of your website. Yoast has made it easy for you, without having to download any other plugins. All you need to do is enter your Meta tag here that Pinterest gave you. If you have a Google plus page for your business or website, you can link your google publisher page here. Just paste your Google plus page’s about page. This is the section where you can access your XML sitemap. View your sitemap: If you click the XML sitemap, but you’ll be taken to the URL of your site. You can use this URL to submit your sitemap into Google search console. Essentially, whatever you chose to noindex, you’ll want to exclude that in the site map. So in my instance I put noindex on my media. Since that was the only thing I added a noindex, I will choose to exclude the media in the site map. Again, going to want to exclude anything that you added noindex to your sitemap. So in my case, I chose to noindex my tags. So I will exclude tags in my sitemap. Breadcrumbs are great for both SEO and user experience. By default, Yoast has the breadcrumbs disabled. This makes sense since most themes will probably have some breadcrumbs functionality inherent in the theme. So many times you probably will not need to enable this within Yoast, as your theme will handle the breadcrumbs. However, there have been instances where you cannot disable Yoast breadcrumbs with certain themes, but you can on other themes. Also, some changes you make to the Yoast breadcrumbs will affect your theme breadcrumbs on some themes. If your WordPress theme does not have breadcrumbs functionality then you may want to consider enabling it in Yoast. At the end of the day, the important thing is that you have breadcrumbs, not so much how you implement them. By default, Yoast will strip the stop words in your URL (permalinks). So if your Title were “The Best SEO plugins,” normally your URL would resolve to /the-best-seo-plugins. However, with this setting enabled it will automatically resolve to /best-seo-plugins. This default Yoast setting makes sense to do for two reasons. Just remember that you can always manually edit the URL in WordPress if you wanted to customize the URL any further. In general though, you should always keep your URL short and consider keeping this setting as the default to remove stop words. To authenticate Yoast with Google Search Console, just click the button and go through the steps. Make sure you have your blog set up in Search Console before trying to integrate it with Yoast. You can let Yoast SEO fetch Google Search Console data to show it right in the Yoast Search Console settings. That’s about it for setting up Yoast SEO and implementing the advanced settings that I recommend in Yoast for optimal WordPress SEO. The theory of these recommended settings is rooted in the way most content management systems work. Content management systems like WordPress can cause a lot of duplicate content issues by using taxonomies. WordPress is dynamically creating links and summaries to all your articles in many places. When Google sees this, there’s a chance it can be seen as duplicate content in Google’s eyes. When you noindex taxonomies archives like tags, author, date, etc, it prevents the duplicate content issue, because you are telling Google not to include those taxonomy pages in Google’s index. SEO is about implementing a whole variety of factors that come together to allow you to rank higher in the search engines. You shouldn’t focus on one thing and get fixated on it. This includes the issue of duplicate content. As an SEO best practice, you definitely want to limit duplicate content. However, there are more important things to focus on, such as great content. For example, if the majority of your content is low quality, trying to eliminate duplicate content is not going to do much. I wanted to see if there were any comprehensive tests or studies done on my recommended settings. Our society values hard data rather than theory right? So I just found one that Harrison Jones did at Search Engine Journal, and he recommended just about every setting in Yoast that I recommended. We’re off to a good start. He found that it increased his traffic by 30%! This shows the power of going the extra mile and tweaking the default Yoast settings is important! With that said, reducing the duplicate content issue may not hold the same significance today as Google has gotten better at handling duplicate content issues from CMS’s like WordPress. It is still absolutely worth doing though. Note: In the article, Harrison also recommends that you install a plugin called WP-PageNavi, in order to optimize pagination links. Prior to Yoast’s version 1.0.2 update, this was a great recommendation. It adds rel=prev and rel=next attributes to handle the Pagination issue. Luckily Yoast is awesome, and they included this as a default in their plugin. I’ve added this functionality to my WordPress SEO plugin, so all you have to do is update to version 1.0.2 and you’ll be taken care of! If you don’t understand it all, just trust me that this default optimized pagination combined with no indexing key taxonomies will most likely be beneficial to your site, and increase your SEO effectiveness. Holy Yoastly Impressive! This has to be the best overview on the Yoast SEO plugin I have ever seen. Also, thank you for offering the Import Yoast SEO settings. Jeff, this is seriously impressive. We use the Yoast SEO plugin on just about every website that we launch and this will help to streamline the overall SEO process from the gates. This is by far, much better than the actual Yoast SEO documentation found on the yoast website as it gives real-world examples of what to do and how exactly to do it. Not to mention the import settings feature. Again, very impressive and thank you for sharing! This is a tremendous post thank you so much. 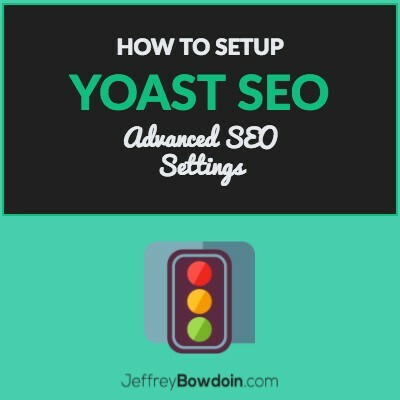 Configuring SEO by yoast can be little confusing not only for beginners but also for pro bloggers so I just rechecked my settings with your settings and every thing was fine thank you. Thanks for this. I’m an older poster and want to optimise my blog, this is helpful and *simple*. Great, I’m glad it helped!